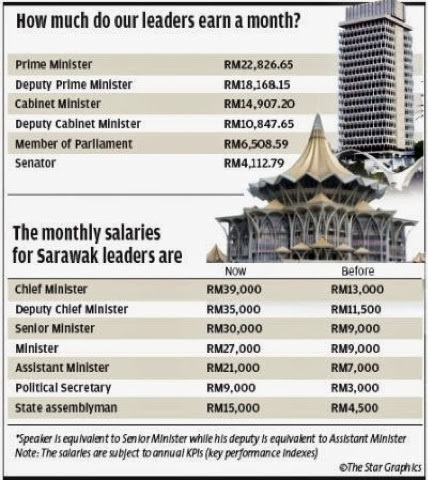 Last week, the media - mainstream and online portals - were filled with mixed views of Selangor leaders salary hikes. Some said they were justified, but many disagree and they heavily criticised the move by the opposition-led richest state in Malaysia. While not interested in politics, let me draw your attention to another move by oil-rich, biggest state in Malaysia, Sarawak. You can read about it here. To compare, our nearest neighbour, Singapore pays its Prime Minister a whopping SGD$2.2 million annually, that's SGD$183,000 per month or about RM471,000 monthly. Then again, Singapore pays it ministers and leaders top money and the city state is in a league of its own when comes to country leaders salary. In no way we should emulate Singapore's remuneration system. 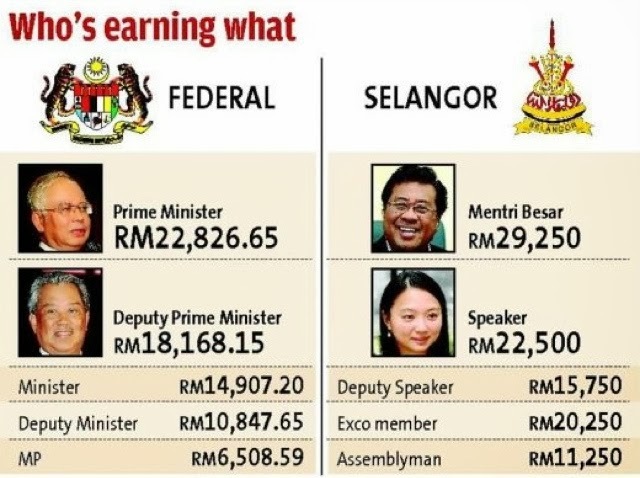 I'm just saying I'm bemused by how people react to Selangor ministers pay hikes. I should have been a YB at the first place. Depa tu kerja teruk sangat ke? Berapa jam keje sehari? @Anon - kerja teruk atau tidak, itu subjektif. Tapi kalau kira "jam kerja sehari", saya kira menteri2 dan YB ni kerja lebih drp 16 jam sehari, kadang2 tu tak kira jam pun. Kalau CEO dan MD syarikat boleh dibayar RM40, 000 atau RM50,000 tiada sebab kenapa menteri tidak layak dpt lebih drp itu. Menteri pun bukan ramai sangat kan.